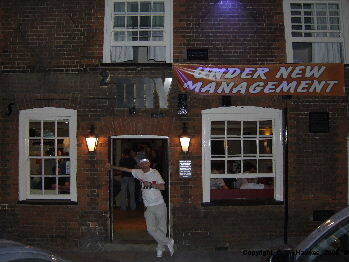 This pub is now called the Old Town Bar, that's original . It used to be called the Two Diamonds when it was a perfectly good Stevenage High Street pub. One day this pub might sort out what it wants to be. A rather quirky small one-bar McMullens at the northern end of the High Street. I wasn't quite sure what end of the market they're aiming for. It had McMullens real ales, but the bar itself seemed to be promoting shots-type drinks more than anything else. They didn't stock tomato juice, which surprised me, so I had vodka and cranberry instead. Mini-pretzel nibbles were provided free of charge which was a nice touch. We were there late afternoon, so you might get a better idea what this place is like later on. It doesn't open till 4pm. Shame they couldn't have just called it the Two Diamonds like it used to be known as for many years. I like the McMullens ale though. Perfectly acceptable pub, McMullen real ales only but always in good condition and usually a choice of three. Plus free peanuts! Recently tied to McMullen brewery under new management, but still continues to serve the Erdinger (the only pub for this Herts) and a more limited range of food. Bar staff very friendly! Has a "wine bar" atmos for the likes of the more mature or professional clientelle with 80's - 90's relaxing backing music. Best to visit on Fridays & Saturdays.